Every protagonist worth his salt needs a feline companion. In the sprawling SMT franchise, the Raidou Kuzunoha games stand out for being a bit different. With real time battles and in-field exploration using demon abilities, the two PS2 games thrust us into the life of Raidou Kuzunoha XIV, a high school student, devil summoner, and part time assistant at a detective agency. Even though many assets and locations are re-used between the two games, there are plenty of differences between them. But which is better? There’s only one way to find out…fight! Both games use a real-time battle system in which Raidou and his demons face-off against other demons. Raidou has a sword for melee attacks, and a gun for ranged attacks which are weaker, but have a stun effect. In the second game, Raidou also gets a heavy melee attack, which consumes MAG. Demons can be commanded to attack or use spells – the second game feels like it offers more control on this front, but at the expense of feel more micro-managerial. Raidou 2 also allows two demons to be summoned at a time, which offers more possibilities for your line-up. Although Raidou Kuzunoha 2 does have more features, somehow for me battle was just a bit less fun than in the first game. In the first game, you have to buy clips and special bullets to add elemental or status effects to your Gun attacks. In Raidou 2, ammo is unlimited, but with a couple of caveats. First off, you have to reload after every six bullets. Secondly, you’ll need a demon with the appropriate spell to add special effects to your bullets. This is much more overhead than just buying the appropriate bullets. In the first game, MAG is just what you need to summon a new demon to the field, or to fuse them. By the latter stages of the game, it is plentiful and rarely runs out. In Raidou 2, matters are very different. Instead of demons having their own MP for spells, it all comes out of Raidou’s MAG store. This means that, in lengthy boss battles where you can’t replenish MAG by killing enemies, you may find yourself running low, and unable to do much until it builds up again. Final boss phase 2, I’m looking at you. Demon negotiation is a mainstay of the SMT franchise. I can’t even tell you how many times I’ve tried to win a demon over to my side, bribing it with Life Stones and Macca, only for it to take offence a something I say and decide to attack me instead. 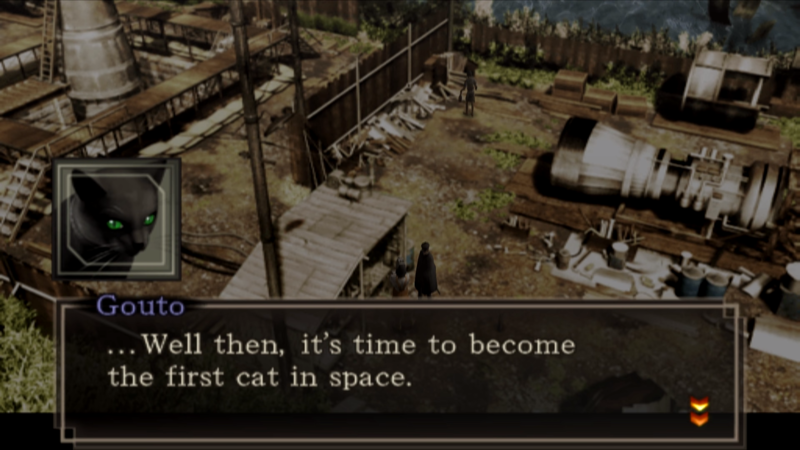 Full-fledged demon negotiation is present in Raidou Kuzunoha 2, but the first game opts for something simpler. To capture a demon, simply hit it with its weakness, then hammer Circle while it’s stunned to confine it into one of your demon tubes. Obviously there are limitations – stronger demons are harder to confine, and you can’t capture a demon whose level is higher than your own – but I actually found the novel simplicity of this method to be a breath of fresh air. You can tell I’ve just had way too much demon negotiation in my time. Both games take place largely in the Capital, in a world where the Taishou era continued into the 1930s. The overworld map and locations in the Capital are reused across both games, but Raidou Kuzunoha 2 also has segments where you venture outside the Capital to other locations. Much as I enjoy wandering the Capital, it’s nice to have a bit of variety. The first game is a pretty on-the-rails experience, with little else to do except plough on with the main plot. Raidou 2 pads things out a bit by also including Case Files, a standard line-up of fetch quests and optional bosses. I’m awarding the point to Raidou 2 for offering more content, but actually I didn’t care a great deal for the Case Files and preferred the stripped down experience of just getting on with the game instead of faffing about with standard RPG padding. In the first game, random encounters can take place even in the normal world. In Raidou 2, random encounters only take place in the Dark World. In the first game, Demon Fusion in the Gouma Den is only accessible from one locaion. In Raidou 2, Demon Fusion can be accessed from any save point. In the first game, although you can strengthen your sword, you can’t change it into any other type of weapon. In Raidou 2, your sword can transform into a different type of weapon – yes, it still looks like a sword for the most part, but heavy attacks change to resemble other weapon types. In the first game, your title doesn’t level up automatically – you have to visit the Nameless Shrine. Raidou Kuzunoha 2 has the “Tube Slinger” title. Overall Winner: Raidou Kuzunoha 1! Yes, it’s unpopular opinion time. Although the general view seems to be that the second Raidou Kuzunoha is the more polished and generally better experience, I found myself preferring the stripped-down simplicity of the first game. In a world where JRPGs frequently bombard us with excessive menu options and gameplay systems, sometimes less is more. This entry was posted in Games and tagged SMT. Bookmark the permalink.